The 2014 Jack Nicklaus Cup Matches are headed north of the border to the Golden Bear’s spectacular Canadian layout at Nicklaus North in Whistler, British Columbia. The event, which marks the 31st playing of the popular Nicklaus Cup Matches, will be held Aug. 25–27. 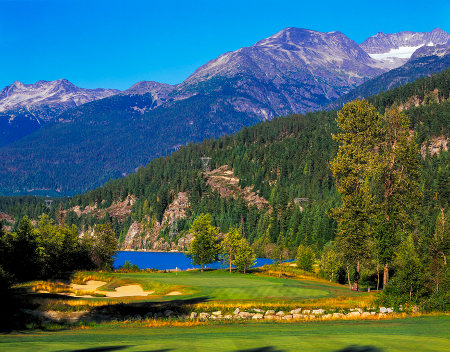 Opened in 1996, Nicklaus North is backdropped by Whistler’s serene panoramic mountain and lake views. The par-71, 18-hole layout winds along a gentle valley floor, offering a spectacular setting for a golf experience. Nicklaus North has garnered a number of awards, and has played host to events such as the Skins Game and a Shell’s Wonderful World of Golf match. Some of golf’s most recognizable names have competed there, including Nick Faldo, Ernie Els, Greg Norman, Fred Couples, John Daly, Vijay Singh, Stephen Ames, and a talented player turned designer, Jack Nicklaus. Accommodations for the matches will be provided by The Fairmont Chateau Whistler, the official host hotel. To make reservations, call please contact Ted Hines at thines@hnssports.com or 614-889-6759.